Take your 1911 or other .38 Super handgun to the range and shoot it at a reasonable cost with this ammunition from Prvi Partizan. These cartridges are a light-shooting target load firing a medium weight 130 grain full metal jacket bullet at 1,213 feet per second. 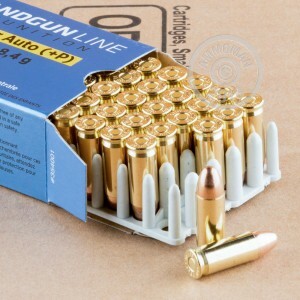 In the full-size guns typically used for this caliber, you can expect comfortable levels of recoil and good accuracy at medium range. Each box contains 50 rounds. 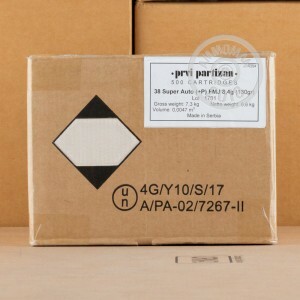 Prvi Partizan ammo is loaded in Uzice, Serbia and uses non-corrosive primers and reloadable brass cases. 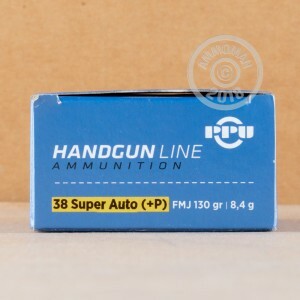 Note that all .38 Super ammo is consider +P, so this ammunition can be fired in any gun chambered for .38 Super.